The worth of the automotive finance market is currently reckoned to be $1.2tn in the US1“US banks pull back from car loans market”, Financial Times, 29/05/2017, http://on.ft.com/2t2vz3z (paywall), in excess of €215bn in Europe (2013 estimate)2“Automotive Finance and Leasing for Consumers in Europe”, Finaccord Ltd., 2013., whilst in the UK, in 2016 alone, automotive consumers borrowed £32bn. As would be expected with a consumer market on this scale, automotive finance is a highly competitive arena with a large number of huge companies battling to preserve or extend their share. Around them, smaller entities circle, consciously looking to disrupt the industry giants through innovations in their business models or use of technology. 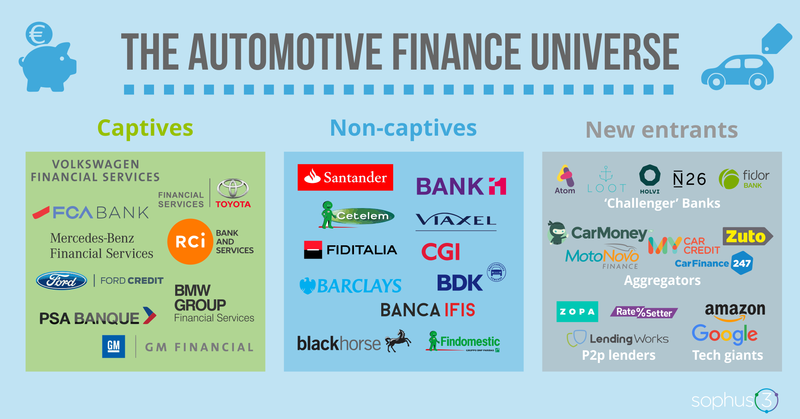 The ‘captives’ are one of the main providers of new car finance, these are the finance arms of the automotive manufacturers, set up initially to service car buyers’ needs for credit and other financial services, such as insurance. Many of these have grown and diversified into other areas, to become in effect full-service consumer banks. In Europe the largest captive is Volkswagen Financial Services with €130bn of loans on its global balance sheet. Nearly all of the major car brands have similar, parallel entities which through their size and profitability are as significant to company revenue as the core activity of vehicle manufacture. The captives have always enjoyed a Point of Sale advantage through having near exclusive access to the customer in the brand’s dealerships at the exact moment they are considering how to fund their desired purchase. Going head-to-head with the car brands’ finance arms are a whole number of globally recognised banks and lenders offering vehicle finance with specialist teams targeting that market. The big players vary from market to market. Spanish bank Santander has perhaps the strongest pan-European presence and is the most active non-Captive in Germany; in the UK, Black Horse finance, part of Lloyds Bank, is the dominant non-captive entity. 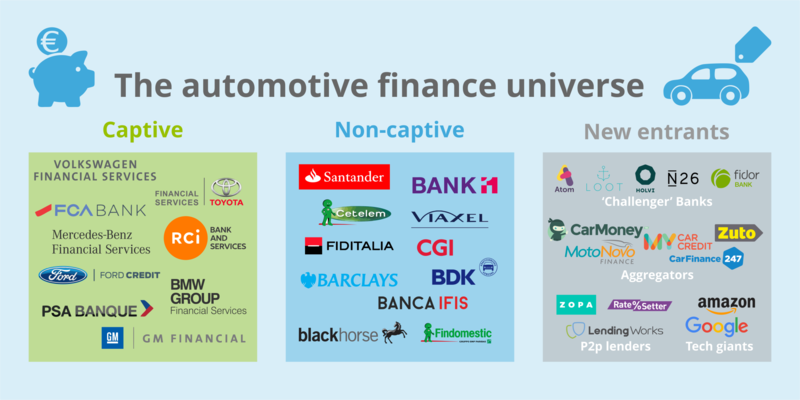 In some areas the distinction between these two pillars of car finance is often blurred with consumer banks providing ‘white label’ finance solutions for car brands in smaller markets or where they have a small market share that does not support a dedicated finance operation. But as we noted in Part 1, the traditional auto finance providers now face competition from new sources. The first are the so called ‘challenger banks’ made possible by changes to the regulatory environment. The smaller of these exploit digital technology with a focus on the user interface to offer convenience and lower costs. They aim to shake up the finance sector in the same way as budget carriers have disrupted the airline industry over the last two decades. Loan finance is an inevitable part of the digital challenger’s proposition: to provide reactive and transparent services at keenly competitive rates made possible by the lack of ‘bricks and mortar’ overheads. More advanced in claiming an ‘alternative space’ within the car finance terrain are a number of peer-to-peer (P2P) lending initiatives. These platforms effectively crowd source funds from savers then offer this money in the form of personal loans. Again, because they follow a largely digital model, the reduction in costs means that they can offer more attractive rates to both savers and borrowers than traditional financial institutions. 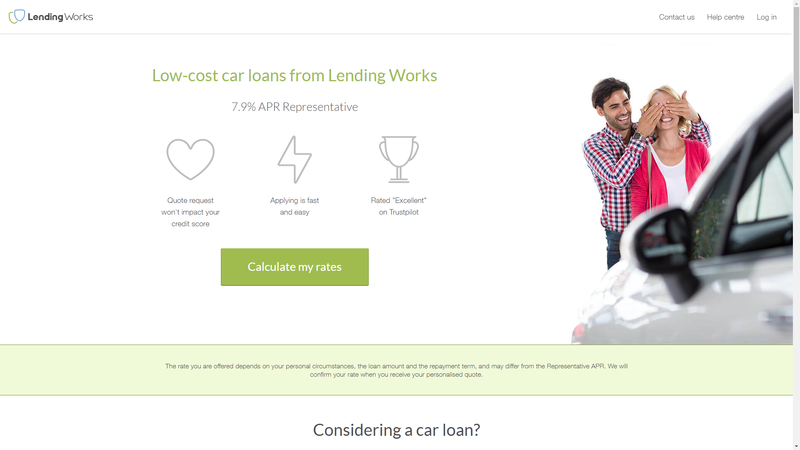 An example from the UK market is Lending Works which offers loans on car purchase “in 48 hours from application to payout”. Their current representative APR to borrowers is 7.9% of which they claim “at least 51% of our customers receive the representative rate or better”. Another irritant to the monopoly previously enjoyed by the captives and large lending bodies are digital aggregators / brokers. 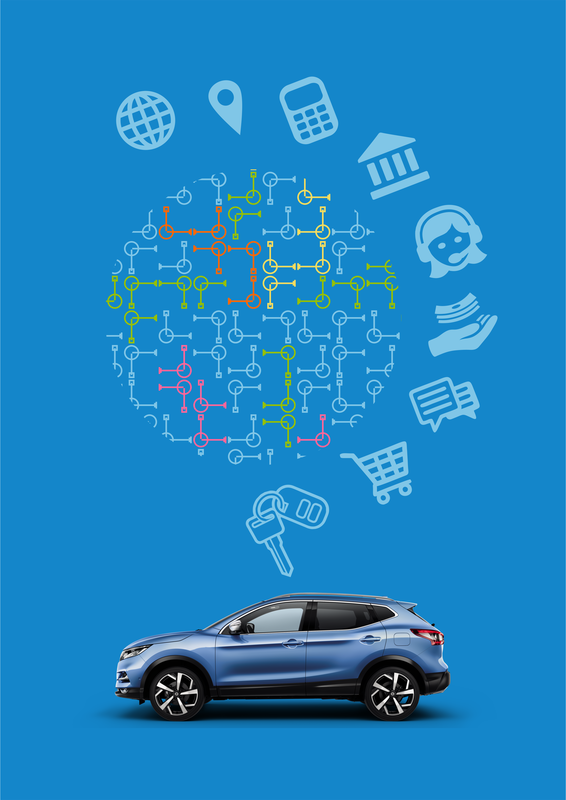 This model has become common in other industries such as insurance (gocompare), travel (expedia), and housing (zoopla) and is now being applied to vehicle finance. 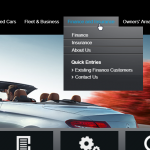 Aggregators offer finance for car buyers from a number of different lenders. CarFinance247 for example “compares products from 18 of the UK’s top lenders to get you the best deal” and stresses “it is a broker not a lender”. Again the customer interface is largely digital. Online applicants for a loan receive an initial response within three minutes, and if approved, receive a follow up ‘phone call “to discuss your budget and agree exactly how much you can borrow”. With a loan approved, the buyer is free to approach any “reputable dealer” to obtain their car. 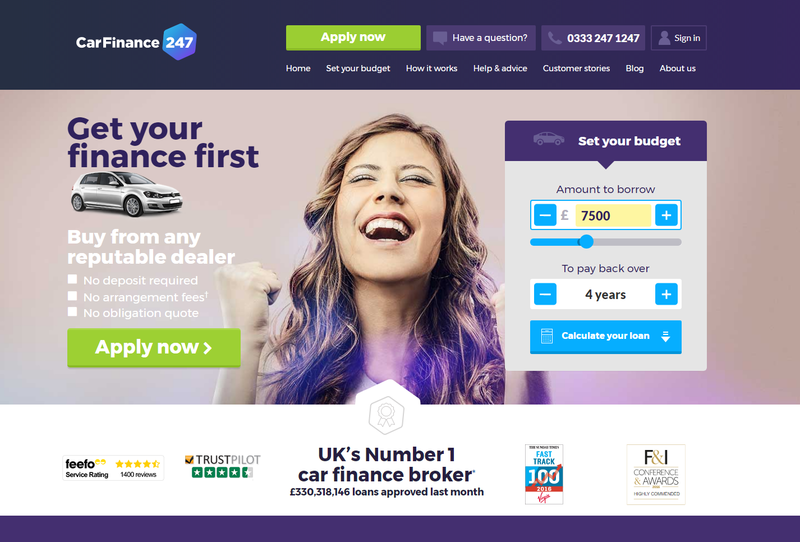 CarFinance247 claims on its site to be “the UK’s Number 1 car finance broker” with in excess of 600,000 visitors and arranging over £300m of approved loans each month. But the biggest potential disruptors yet to enter the car finance market are the so called ‘tech giants’. Google, Apple, and Amazon. Each has been actively growing its capability in the payment space, with, respectively, ‘Android Pay’, ‘Apple Pay’ and ‘Pay with Amazon’. Amazon looks particularly committed to move into consumer finance through its extension into credit cards and the expansion of its Lending Division. 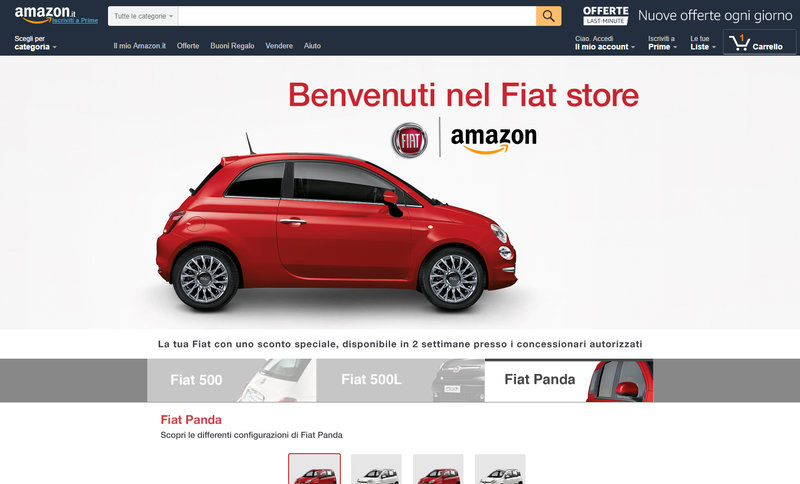 It is also showing keen interest in the new car market through its partnering in online sales with FCA. What all of these new disruptors have in common is that they are digitally savvy – at a time when consumers in the car market are moving rapidly in that direction, whilst the incumbents – the OEMs, their dealers and finance arms – are, in many cases, resistant to change. 2. 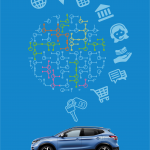 ↑ “Automotive Finance and Leasing for Consumers in Europe”, Finaccord Ltd., 2013.